Well, it wasn't exactly Frost / Nixon, was it ? 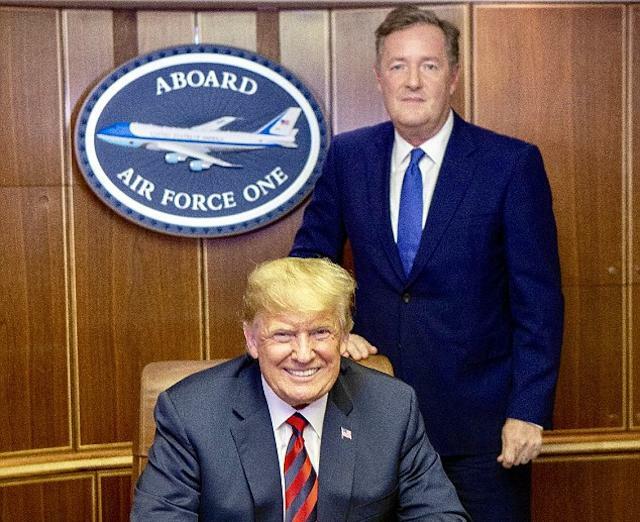 Poor Piers 'Useful Mouthpiece' Morgan touted his fawning 'interview' as being 'historical and groundbreaking'. Rather than actually ask the question that everyone need the answers to, it turned out to be a validating 'info-mercial' for Trump's policies, and a facilitation of the stances that he backtracked on less than 24 hours later. Morgan defended the interview, saying 'he didn't have much time'. It was such a non-event that the airing was beaten in rating by a year-old repeat of (for non-UK readers) a Comedy News Quiz called Have I Got News For You. 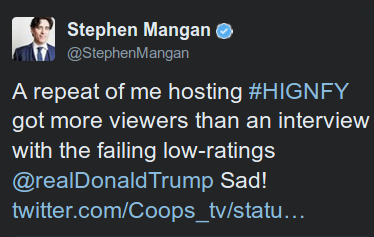 A repeat of me hosting #HIGNFY got more viewers than an interview with the failing low-ratings @realdonaldtrump Sad! Morgan's lickspittleing has long been known in the UK. As has his shares fraud, faux 'celebrity' journalism, illegal phone-hacking and his desperation to be connected to what he sees as his social superiors.